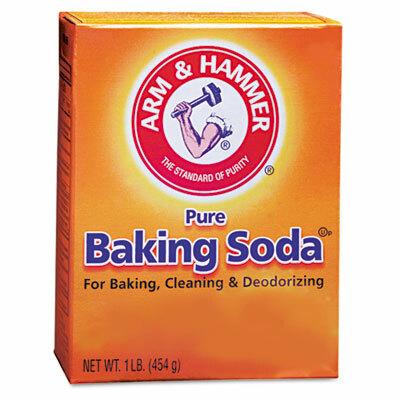 Baking Soda is mildly abrasive and naturally deodorizes. Got a box in the fridge? I have started using baking soda to clean my sinks and toilets. I have also used it in dishes that have baked-on food. You can also make a paste with water or vinegar (I prefer vinegar, seems to clean a little better) that you can set for 10-20 minutes on tougher grime. Baking soda and lemon juice is an excellent deodorizer and smells less than vinegar. Place equal amounts in a small dish, mix well and set around your home in smelly areas (like the bathroom or laundry room…). Baking soda can be used to remove marks from walls and other painted surfaces. Sprinkle a damp sponge lightly and gently rub on the affected area. Rinse and dry. I have only ever cleaned an oven once. When we moved last year and it was, by far, the thing I hated the most about all the cleaning we had to do. Wish I had known this one… Wipe down your oven with a damp sponge. Min 3/4cup baking soda, 1/4cup salt and 1/4cup water to make a thick paste, and spread around inside your oven. Be careful not to get any on bare metal and watch around the openings. Let the paste sit overnight. Remove with butter knife and wipe clean. Tough spots may need to be scrubbed. I haven’t tried this one, but I will the next time I have to clean an oven. If nothing else, it would smell better than the chemical spray I used last year. Hydrogen Peroxide and water make a great combo for killing and getting rid of mold. Does your shower grout get moldy? Mix 1:2 ration of hydrogen peroxide and water in a spray bottle. Thoroughly coat the surface and let it sit for at least an hour. Rinse well and let dry. Rubbing Alcohol is another solution I didn’t know much about. I’ve used it to removed stickiness that price tags have left behind and permanent marker from the bathroom counters, but I didn’t know about using it on glass, mirrors, windows and chrome fixtures. Use a 1:1 ratio of rubbing alcohol and water. Add 1 tbs of vinegar to every cup of alcohol for an added cleaning punch. You can also use this recipe to make glass cleaning wipes. Just add paper towels in a container. Lemons are one of nature’s strongest cleaning agents. To disinfect and clean your cutting boards, squeeze lemon juice on the cutting surface. Let it sit for a couple minutes. Rinse. I really like that it won’t hurt my family if I happen to miss rinsing a spot, just add a little zing to dinner. For a bleach-less dishwashing soap, mix equal parts of borax and washing soda. You’ll have to increase the washing soda if your water is hard. I do a one part borax and two parts washing soda to combat hard water stains. Laundry detergent is expensive! I haven’t had the chance to compare costs yet, but this recipe for a homemade detergent leaves me happy. It cleans just as well as the Tide we used, but doesn’t have as many harsh chemicals in it. I mix 1 cup Ivory soap, 1/2 cup washing soda and 1/2 cup borax. Use 1 tbsp for light loads; 2 tbsp for heavy loads. I haven’t tried this one, but had to share it. If you do try it, let us know if it works. To remove water rings on a wooden table or counter top apply toothpaste or mayonnaise to a damp cloth and rub into the ring. Once the ring is removed, buff the entire wood surface. Olive oil and lemon juice make a great furniture polish. This is one recipe I am now hooked on. We have a coffee table that gets grimy really easy. Especially with Little Monkey around. I’ve tried tons of products to help protect it, but I usually had to polish it about twice a week. I tried this solution and now only polish every 7-10 days. It’s easy and effective. Mix 1.5 cups of olive oil to .5 cups of lemon juice in a spray bottle. Shake well and spray a little on a soft rag. Polish as usual. I got the above recipe ideas from organizedhome.com and easyearth.com. I have tried most of them, and the ones I haven’t tried I said as much. Some of the recipes I have tweaked to my liking and others I used straight off the sites I found them on. There are tons of other recipes out there to clean just about anything you could possibly imagine. All of these products are easy to find in stores, cost far less than other cleaning supplies and are safer for the environment and your family. Try some of them and you may decide it’s worth the effort to save some money and use safer cleaners in your home. Do you have any homemade cleaning solutions you use? I tried the peroxide/water solution on the shower and it didn’t work. The mold is still there. Any suggestions? Flexi pack offers a full line of critical cleaning detergents for a wide range of metal cleaning applications. Our products make cleaning metal surfaces fast and easy, saving time and money in the process. Service to the industry, precision formulation, quality control, and excellent technical services are the benchmarks of Flexi pack. For water marks I cover the area with vaseline, let sit for 24hours and wipe clean. Really seems to work!! I am looking for a “recipe” for laundry stain remover. I make my own laundry soap(a bit different from the one you posted). I posted my laundry soap recipe on my blog today. If anyone has laundry stain remover tips, please let me know. I would like something that can be ready ahead of time, like in a spray bottle?? Lots of great ideas here. I will try the peroxide on the mold in our windows. So far I have been using the vinegar there, but I just don’t think it is doing anything. I will try the bakinsoda mix to clean my oven, it really needs it. Thanks for sharing. I’m going to try that hydrogen peroxide/water spray today… Just to let you know, those little ants (Pharaoh ants? ), y’know, the ones that smell like Pine Sol when you squish them, are attracted to rubbing alcohol. I found out that if I cleaned using a rubbing alcohol solution I’d get swarms of ants. They don’t like the wintergreen-scented alcohol, though, and I read somewhere that if you add peppermint oil to your rubbing alcohol, they don’t like that either. Thanks for the tip about sticky price tag residue and rubbing alcohol. I didn’t know rubbing alcohol took off the adhesive left from price stickers. I hope I remember that the next time I need it. To clean baked on yuck from my oven, I make a paste of baking soda and water, put it on the yuck, let it sit, then pour vinegar on it. The bubbling reaction makes it so easy to wipe up with a sponge. Great minds think alike! I posted cleaning tips at BNOTP too. Have a nice day! Thanks for sharing some great tips, I’m still trying to find an eco none to smelly way to descale the kettle! Might try some of the above! Great tips! Thanks for linking up to Making It With Allie! I can’t wait to see what you have for next week! My sister makes her own laundry soap and loves it. Definitely on my to-do list. I just found your blog and am your newest follower. Thanks for the great tips. Let the spring cleaning begin!! Love these tips. Thanks for sharing. Anything that makes cleaning easier or more ‘green’ is so welcome. 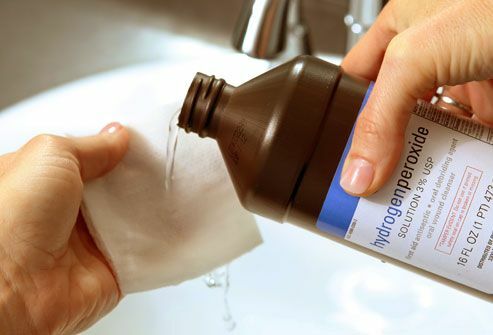 Hydrogen Peroxide can also help remove dried blood from clothes. Just pour it on, let it sit a couple of minutes and wash as usual. I have been wanting to try the homemade detergent recipe, most look too large but this one seems doable. I love everyday household items as cleaners. I just made a Carpet Freshner out of Baking Soda and Lavender oil–works great! I’m your newest follower from the Boost My Blog Friday Blog Hop. Also following on Facebook. If you get a minute please drop by and follow back. Have a wonderful week!